The online registered business search tool facilitated by the Vermont Secretary of State lets you find entities and corporations that are registered with the same. Here we have described the step by step procedure of how to search for an business entity in the database. To perform the search you need to know the business name or business id or the filing number. The search page is also feasible for advance search giving you more search options to choose from. Below is a step by step guidelines on how to use the Vermont business search tool. 1. The first step is to access the Vermont business search page by clicking here. The page looks like the screenshot given below. 2. The business search form allows you to search by business name, business ID, filing number or previous business name. You can also select how to search including Starts With, Exact Match or Contains. The form has an advanced search section that provides additional search options to help widen or narrow your search results. For this example we will only search by name. Go ahead and type "Air Now" in the "Business Name" field. Also select the "Starts With" option. Once you have done this the next step is to enter the captcha code right above the "Search" button. This is for security purposes. Once you entered that, click the "Search" button as shown in the screenshot below. 3. When you click the "Search" button it will then show you a list of results that match your search query. It displays the business name, business ID, business type, office address, agent name and current status for each business entity found. 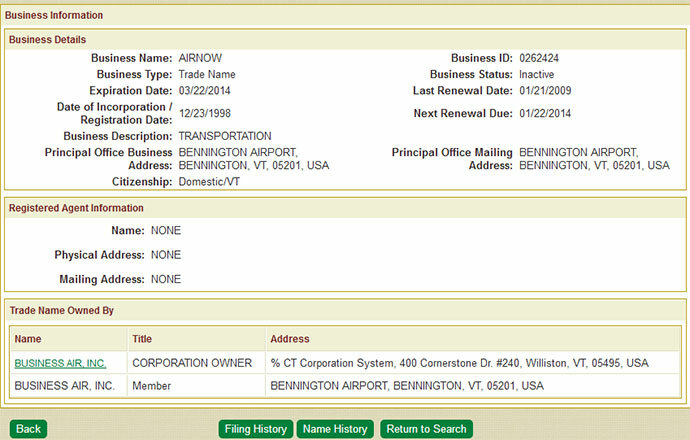 Click on the business name to view details for that business, as shown in the screenshot below. 4. Once you click the business name to view the details, it will take you to a page that shows the business entities name, business type, status, next and renewal date, business description and more. You can see it in the screenshot below. 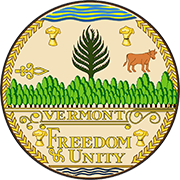 The Secretary of State of Vermont is one of the five cabinet constitutional offices in the state. The term of the Secretary of State of Vermont is for two years. It is an elected constitutional office. The current Secretary of State of Vermont is James C. Condos.